Fail to develop your leaders and your whole organization will suffer – both in the short and long term. There is fierce competition to find and retain qualified tradespersons, supervisors, and managers. If your organization is facing a shortage of skilled labor, it’s especially critical to keep the people you have, and be recognized as a preferred place to work. That depends on your supervisors and managers being productive leaders. Employers often believe employees walk for a better-paying job. But that’s not the only reason. Tradespersons, and especially those who are highly skilled, will walk in a heartbeat whenever another alternative looks better. Better opportunities appear more readily when workers have the chance to get away from a bad boss. They may say they are leaving to get better pay, career development opportunities, or improved work-life balance. The motivation is to reduce stress. Stress results in reduced productivity and health issues. Those who are less likely to walk are the ones who are treated fairly and who encounter a consistent, predictable workplace culture. This workplace culture is a result of productive leadership. What’s in it for the workforce when the workplace culture is guided by productive leadership? There’s potential for a lower-stress work environment, for one, plus there are opportunities to learn and develop new skills. In addition, team members’ input gets heard when they have an opinion about an improvement. In general terms, they have the chance to work for supervisors who don’t irritate the stuffing out of them. What’s in it for supervisors? A leader delivers value to an organization through the performance of his or her team. If a supervisor lacks sufficient leadership skills, and they are not provided with training, their organization has put them in a bad position. But that doesn’t matter. The supervisor is still expected to perform. When properly trained, most supervisors can improve performance of themselves and their team. Stress is lower because team members feel respected and more engaged. The supervisor feels better about how they lead. When supervisors can actually supervise, they can focus on solving issues that cause problems for their team, making the team more effective and reducing stress. When you solve problems for people, they feel more appreciated. Great supervisors spend time with individuals, learning what their goals are and providing opportunities for them to move towards those goals. That includes providing opportunities for their team members to learn new things through training or delegated responsibilities. What’s in it for managers? The more senior you are in an organization, the more that the financial bottom line affects you day to day. The value in productive leadership is in two main areas. First, when teams are executing effectively and efficiently, an organization will experience lower operational costs. Second, turnover and related costs can be reduced. A productive leadership development program will help managers evaluate supervisors and prospective supervisors, identify strengths and weaknesses, provide recognition to strong supervisors, and identify areas where supervisors need to improve. Where can value be found? When supervisors and managers are more engaged, a 20% labor efficiency improvement can be achieved. This means getting the equivalent of one additional worker for every five workers in your workforce. For 100 employees at $40,000 per employee (a conservative figure), that equates to $800,000 per year, or 20 additional full-time-equivalent workers at no additional cost. Increased stress and lower productivity during the on-boarding and as the new hire gets up to speed. It takes about 18 months to get a new employee fully acclimated and integrated into the team’s routine and culture. A turned-over position with a loaded rate of $40,000 per year would result in a $10,000 cost per position turnover. If you have 100 employees and 10% annual turnover among them, that’s $100,000 per year, or 2.5 equivalent workers, just due to position churn. A good leadership development program that leverages best-practice tools and information can achieve significant return on investment (ROI) via lower turnover and higher productivity. Recognizing that there is a massive, long-term, skilled worker shortage , organizations can and should do what they can to improve their work environment. A dedicated program to develop productive leadership can improve the workplace, reducing the risk of workers leaving. Where do employers go wrong when it comes to leadership training? The following are the most common problems. Can you expect top performance if supervisors and managers are unmotivated? Can you expect to have motivated supervisors and managers if they aren’t proficient in leadership best practices? Consider a facility with supervisors leading an average of 10 people on their team and each manager having five supervisors as direct reports. In most organizations such an organizational structure results in something between 80% and 90% of the organization’s population being led by supervisors and managers. So, if we want to improve workforce performance we should focus on the leadership levels that are directly engaged with the largest number of people. Leadership training should be provided to supervisors, managers, and prospective supervisors and managers at least once every two to three years. Training every year would be overkill and would result in overspending with little additional value. Less than once every three years will not be sufficient for retaining skills and knowledge. 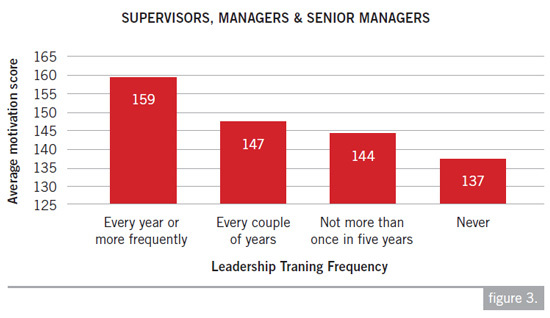 This means that 45% of supervisors and 54% of managers surveyed haven’t received adequate leadership training. 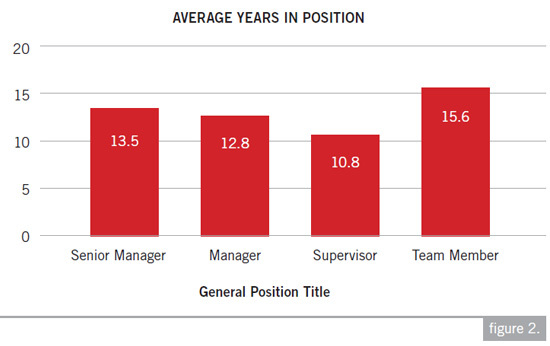 Among survey respondents, the average supervisor had been in his or her position for 10.8 years, and managers had been in their position an average of 12.8 years (see Figure 2). This means that half of the supervisors and managers, directly leading 80% to 90% of the workforce don’t receive adequate leadership training. 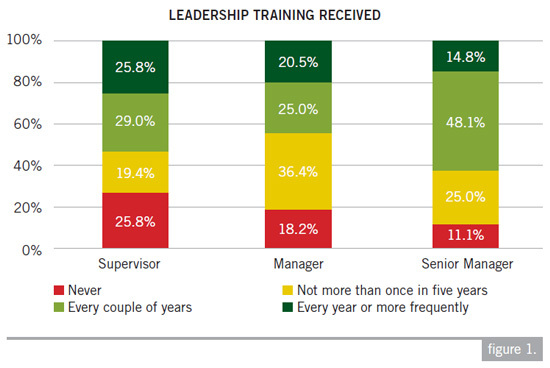 The survey also showed that there is a direct correlation between the frequency of leadership training received and the level of motivation that the leader experiences (Figure 3). The lowest motivation scores were seen with leaders who never received leadership training. Motivation scores progressively increased as training frequency increased. The average motivation score for leaders (supervisors, managers, and senior managers) was around 147. Average to above-average motivation requires more frequent leadership training. Here’s a typical scenario. The plant manager recognizes that there’s a problem with leadership. Policies and procedures aren’t followed. Turnover, grievances, and absenteeism are too high. Safety incidents are on the rise. some leadership training. Several local training firms are contacted and asked to submit proposals. The HR director selects the contractor that scores highest on what I call the glossiest-brochure/lowest-cost index. The total cost of the course, not including the attendee’s time, is around $9,400 (funny how they seem to come in just under $10,000). A dozen supervisors and managers attend the training. The training is a day long and covers time management, communication skills, rewards and recognition, and group decision-making. The content and subjects are different from what the last training contractor presented a few years ago. But hey, it’s leadership training. The trainer delivers the course and submits an invoice to get paid. Done. After the training is completed, the attendees are asked how the training went. A couple of them report that it was great training and that they appreciated the opportunity to attend. A couple of others grumble that it was a waste of time. The rest feel that the information was good but they question whether they’ll be able to apply what they learned. Morale improves in the short term as the workforce pokes fun at the supervisors and managers who attended the training. There is no significant improvement in leader or team performance. Nothing changes.